A walk around the picturesque Plaza de la Constitución is a feast for the eyes. Gilded architectural treasures, historic monuments, expansive harbor vistas and an exquisite collection of history statuary whet the visual appetites of countless passersby. Now, close your eyes. 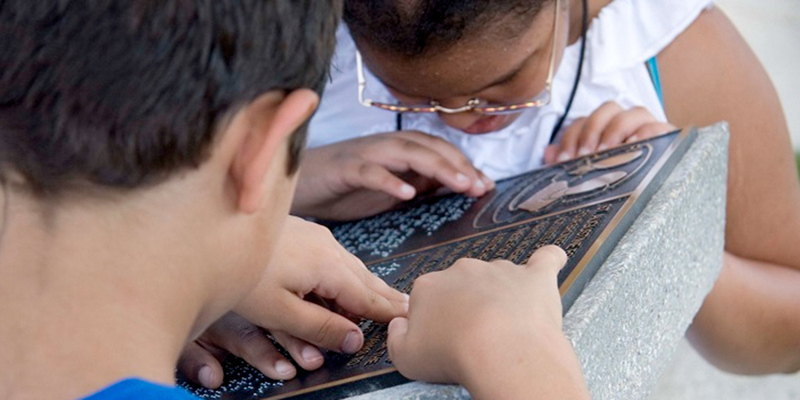 Imagine experiencing the beauty of St. Augustine as a blind person. That’s a challenge the St. Augustine Art Association met when the nonprofit arts organization created the TOUCH St. Augustine “Braille Trail,” an installation of bronze Braille markers for the citywide public works of art. Inspired by the art association’s annual Tactile Art Show–an exhibit of touchable art with Braille signage–TOUCH St. Augustine created a permanent citywide tactile art installation beyond the gallery walls. The “Heavenly Bodies” sculpture at the art association’s Sculpture Garden was created by local artist, Enzo Torcoletti. The contemporary stone and steel sculpture symbolizes the first contact between the Old and New Worlds. Local artist Richard Weaver created the “Signal from the Shore” sculpture to place opposite of “Heavenly Bodies.” The bronze statue of a Native American boy honors the struggles and sacrifices of the indigenous people.